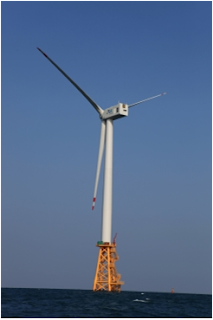 Samsung Heavy Industries, a Korean shipbuilding company, is going to build a large-scale offshore wind farm in Jeju island with Korea Southern Power Corporation (KOSPO), which is a state-run company. The shipbuilding company formerly announced that it obtained an order from its special purpose company (SPC) to build 12 units of 7-megawatt (MW) offshore wind turbines. 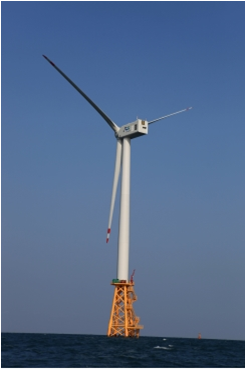 Earlier in September, SHI has a partnership with the KOSPO and established an special purpose company (SPC), namely, Daejeong Offshore Wind Power. According to SHI, they have plans to finish the construction by the end of 2014 and start commercial operation from 2015. During the contract, they will be responsible for the entire process including engineering, procurement, manufacturing, installation, as well as test operation of wind turbines and wind turbine foundations. In the meantime, as advanced economies have been striving to enlarge the use of new renewable energy sources, the wind power market has an enormous potential in growth. The European market for offshore wind power generation, especially, is projected to more than double from $13.5 billion (3.3 gigawatt, or 3.3 GW) in 2012 to $30 billion (7.3 GW) in 2020. With the aim of tapping the rapidly growing European market, the ship manufacturer decided to install a 7 MW wind power turbine for test operation in Scotland in January this year and isigned a contract to establish the power grid system in the region to sell electricity produced from the wind farm. Afterwards, SHI built an engineering center in Hamburg, Germany in July to facilitate development of new technologies. P.S. this post was referred to the article that Maeil Business Newspaper wrote.